You’re searching for synthetic siding for a reason and it’s probably because you’re sick of painting and the maintenance that comes with wood shingles or lap siding, or at least you're sick of the idea of it. There are pros and cons to anything synthetic, and for decades the same has been true for siding. The benefits, at least in theory, of synthetic siding are that it’s low-maintenance, doesn’t require painting, and it is durable, again—in theory. The cons, at least in perception are that synthetic siding is unattractive, untraditional, and fake-looking. For decades this was a pretty accurate assessment of your siding options as a homeowner. You could get a lower maintenance product, but in return you’d have to sacrifice the curb appeal and attractiveness of your house. For a long time no siding option existed that actually looked like real wood but didn’t carry the burden and expense of tedious maintenance. Everlast Composite Siding was engineered to deliver all the pros of what any homeowner desires in siding, without all of the cons as stated above. The beauty and success of Everlast composite siding lies in the fact that it looks very much like real wood clapboard (lap siding), but performs much more like a synthetic product—meaning it’s durable, long-lasting, and doesn’t require painting. Not convinced? 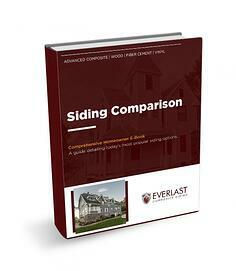 Download our free comparison guide to see more details of how Everlast matches up against other commonly used siding products. Download it here.